Next time you go to the mall take a look at the cars around you. Can you tell which ones are newer and which ones are older? You probably have a good idea of which ones are older even if you don’t know anything about cars. Take a look at the image below. Chances are, you can tell the 1981 Honda Accord apart from the 2014 model just by looking at them! And what about clothes? If you saw someone wearing a patchwork sweater you can be sure they bought it in the 1970s. That’s because the things that people make and use change in appearance over time. One fashion style might be new and unpopular at first, but soon everyone is wearing it. Then, one day, the baggy patchwork sweater you used to love is no longer trendy and gets replaced by shoulder pads! The style of an artifact, like a stone tool or a piece of pottery, also changes regularly over time. Change can happen in fits and bursts, or steadily, depending on the style. Archaeologists use changes in trends to figure out how old a site is based on the style of artifacts they find. This is a type of relative dating known as seriation. Before seriation can be used as a dating technique, artifacts need to be put into a sequence known as a typological sequence.. This lets archaeologists see changes in style over time. If you take another look at the Honda Accords below, you can see that the 1981 and 2014 models look very different. If you look at the cars in between, you can see how the style of the 1981 model slowly changed into the style of the 2014 model. Typological sequence for Honda Accords. See how the car changed style through the years? If you only looked at the 1981 and 2014 models you might not even recognize these as the same car. But by finding the entire sequence you can see how the car’s style gradually evolved into one we recognize today. How do archaeologists learn how old a site is using seriation? Once archaeologists understand the sequence, they can count all the different styles of artifacts found at the site. Archaeologists then do some math to figure out what percentage of a kind of artifact, for example pottery, are made in a particular style. A graph is then constructed to see how the styles compare to one another as a part of the whole. As archaeologists examine artifacts, they notice how the different styles are common, or trendy, at different times. While one style may be popular now, it likely will have been less popular early on and will likely become less popular later. As popularity of a style changes so does how common it is, so the more popular it is the more examples of it archaeologists will find. With this in mind, archaeologists track how common a style of artifact or site is over time to see which may be older and which may be newer. An archaeological seriation of pottery sherds. Note how the patterns of lines change over time and over different regions. 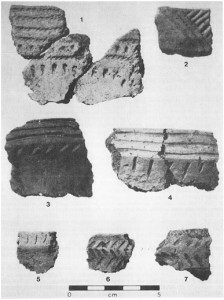 Numbers 5-7 are of an earlier style than numbers 2-4, while number 1 was likely traded from Michigan All of these pottery sherds were found at the Edwards site, just west of London. 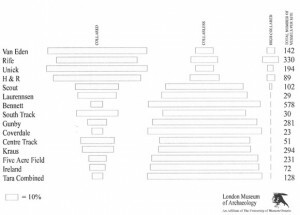 Graphs like this are common in archaeology. This shows the seriation of 15 archaeological sites,. 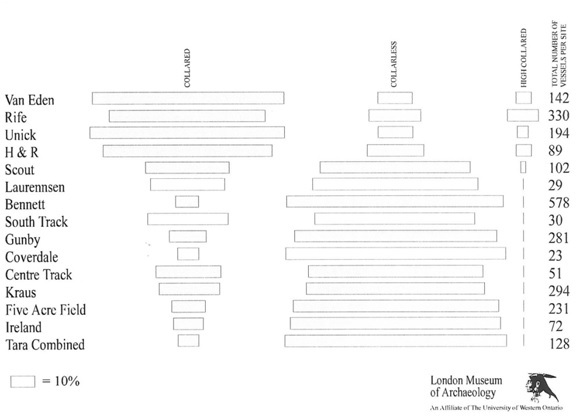 The percentage of types of pottery found at each site is shown by the size of each bar. Collared and High Collared sherds are most common at the Rife and Van Eden sites, while Collarless sherds are more common at the Tara site. Collared sherds were more popular later in time than Collarless ones, so the Van Eden and Rife sites are the youngest. These graphs are sometimes called battleship graphs because the shape of each type looks like the outline of a battleship. Seriation is one of the oldest dating methods used by archaeologists, and is still very important today! Like all relative dating methods seriation can’t tell you exactly how old a site is in absolute year, but it can help you estimate its age. Archaeologists use many dating methods at the same time in order to determine the age of an artifact or date of a site, so it is important for them to be mindful of the different clues and samples that may help them learn more. Want to learn more about dating methods? Be sure to check out the series introduction or follow the links below!